This firm will reaffirm its positioning as the 'material of infinite possibilities' at the Pordedone Furniture Fair. The Visual, Creative Experience and A&D areas will coexist with the K·LIFE space, destined to transmit the properties of this innovative technology. 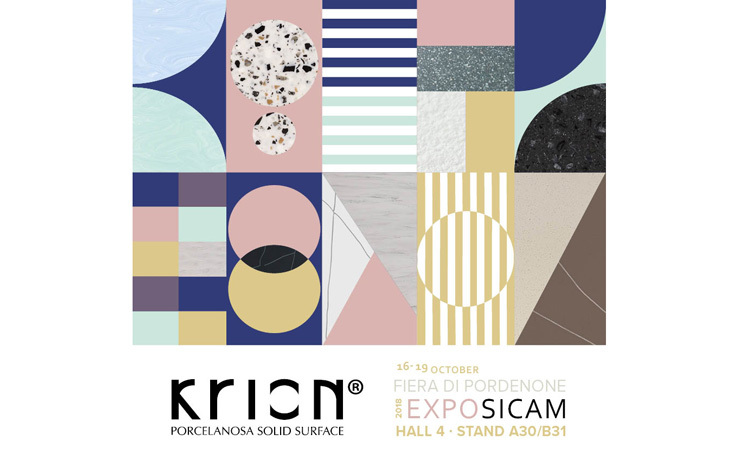 From October 16-19, KRIONTMPorcelanosa Solid Surface will be present at SICAM 2018, the International components, technology and accessories fair for the furniture industry. Held in Pordedone in Italy, this event is an excellent opportunity for KRIONTMto reaffirm its position as a material with infinite possibilities for architecture and interior design, and it is for this very same reason that this firm has arranged its exclusive design in four different spaces. The K·LIFE Areawill encourage professionals and visitors to discover the innovative KEAST technology (KrionTMEco-Active Solid Technology), which has been a revolution in the improvement of the quality of people lives. To the innumerable properties of the KRIONTMSolid Surface, four new characteristics have been added: air purification, antibacterial effect, elimination of chemical products and easy cleaning. Visitors will be able to see the technical characteristics of K·LIFE up close, which means unprecedented technology that is completely different to everything that has been seen so far. The Visual Experience Areawill be based on the purity of the KRIONTMmineral compact and its endless application possibilities. SICAM attendees can learn about the properties of this material through these applications, confirming its great versatility. The Creative Experience Areawill encourage experimentation with the material. The space will be presented as a place of interaction in which the latest innovations and trending materials will be presented in an unusual way, driving the emotions between what is rational and what is didactic. Finally, the A&D Areawill be the support point to develop, in greater depth, the training activity on the technical properties of the material. KRIONTMwill influence here through its professional advice, informing everyone about the training that this firm periodically has on transformers. All the experience built by KRIONTMfor SICAM revolves around discovering the material and its wide range of possibilities. To do this, the PORCELANOSA Grupo firm wanted to outline this innovative KrionTM Customer Material Experience which has been developed exclusively for the visitors, who have an immersive experience and direct contact with the material about which advice is sought from professionals regarding the most technical aspects, allowing for the flow creativity at all times. SICAM is a very important fair in Europe in the furniture design sector. Each year, it has more than 7.500 visitors from all over the world with more than 32.000 metres of exhibition area and 580 exhibitors. Discover the KRIONTMdesigns at the A30 / B31 stand at the Pordedone Fair from October 16 to 19.